Growing Up Disney: Minnie Moms: What If I Gave You A Huge Disney Gift Card? Minnie Moms: What If I Gave You A Huge Disney Gift Card? I gave the Minnie Moms quite a challenge this month: to choose what Disney merchandise they would buy if I handed each lady an unlimited Disney gift card. The catch was that it had to actually be available and be somewhat reasonable, so buying themselves the Castle Suite forever or a lifetime supply of Disney Vacation Club points didn't count. With this mission, we have chosen our personal Disney splurge items. Amy: I went straight for the diamonds. They are a girl's best friend and when you put three of them in the shape of Mickey, it's a lifetime relationship. With my fictional unlimited gift card, I would select the diamond and platinum Mickey Mouse necklace from the Disney Dream Collection (fitting name, huh?) At $3,600, it is far more than I would spend in the real world but it is lovely. If I could use the card for someone else, I'd by DisneyDad that ginormous wooden Mickey statue that was in Art of Disney for years. I think it was about $8000. Natalie: During many of my vacations to Disney World's Magic Kingdom, my son and I have enjoyed viewing the Art of Disney in the Main Street Cinema. You can often find many painting and collectibles in this store. My son really loves going in there to watch one of the Disney classic movies while coloring a Disney picture. I have frequently appreciated the art found there and mentally hung one piece or another in my house, thinking how good it could look! Though I have fallen in love with many of the pieces of art found in this Main Street attraction, I found another piece of art which I would much prefer if money were no object! On our last vacation to Disney, my son and I decided to stroll through the Crystal Arts to see all of the crystal and glass art pieces. It was then that I discovered the piece of art that is TOP on my list of items I would purchase should money be no object. 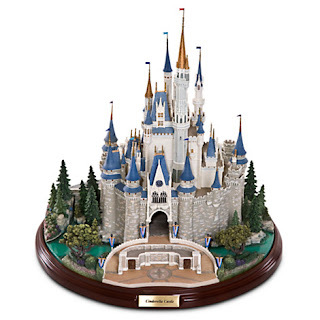 The piece of art is this "Limited Edition Walt Disney World Cinderella Castle Structure by Arribas Brothers"
This piece of art includes 28,255 dazzling Swarovski(r) crystal stones which are hand set by the Arribas Brothers artists. The entire piece measures 20'' H x 11'' W x 12 1/2'' D. The cost of this beautiful piece of art is $37,500! What do you think? Would you was this very expensive piece of art if you could afford it? Janine: What would I buy with an unlimited gift card? 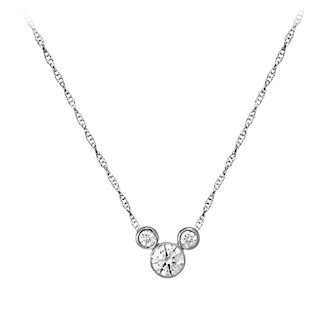 Since I am not allowed to choose renting the whole of the Grand Floridian for the night, I think I would like a really nice keepsake of my favorite park, The Magic Kingdom. And what better than a Cinderella Castle miniature? With a price tag of almost $400 you can bet your bottom dollar it will never actually find its way into my home, but boy it sure is pretty! Danielle: If given a virtual unlimited Disney gift card, I would definitely be high-tailing it over to The Art of Disney at Epcot to buy one of their large, framed pieces of art to put over my couch. Whether I'm at Walt Disney World or on a Disney cruise ship, I always make sure to peruse the beautiful art work for sale. It's all simply phenomenal, and a large piece like that would serve as a beautiful focal point in my home to represent the level of importance that Disney plays in our family's happiness. Until that virtual gift card arrives, though, I will settle for my unique piece of photographic Disney art that I purchased on Etsy to display over my couch. Corby: I have a confession, I'm one of those that goes to Disney World and rarely buys souvenirs. I know, crazy, right? I let my kids pick out one souvenir each trip and they usually choose some sort of candy. Do I get off easy, or what? I have started purchasing a Christmas ornament from each trip that fits that particular vacation's theme. The year, we cruised on the Disney Dream I got an ornament that looked like the ship. The year we stayed in the Cabins at Ft. Wilderness I got a rustic looking ornament that reminded me of the campground. You get the idea. I don't wear Disney clothes/accessories, collect vinylmation and I'm not an avid pin trader so I had to think about what I would purchase if given a gift card. Personally, I would use the gift card for some yummy Disney food/recreation. Perhaps a meal at Victoria and Albert's, one of the Backstage Tours such as Keys to the Kingdom or maybe Dine with an Imagineer. These are things that are on my wish list of to dos for future trips. I would also normally use the gift card for another vacation! However, Amy said this is “virtual window shopping” so since I am shopping for something that is actually in the stores/online for purchase I'm going for this. I do believe that would look oh so cute on my shoulder, don't you (hint, hint to my husband)? Beth: If money were no object, there are certainly plenty of things I would purchase during our Walt Disney World vacations. But on our last trip, I discovered something really unique that I had never noticed on previous trips. While at Disney Pin Traders in Downtown Disney, I noticed they had pin collages. 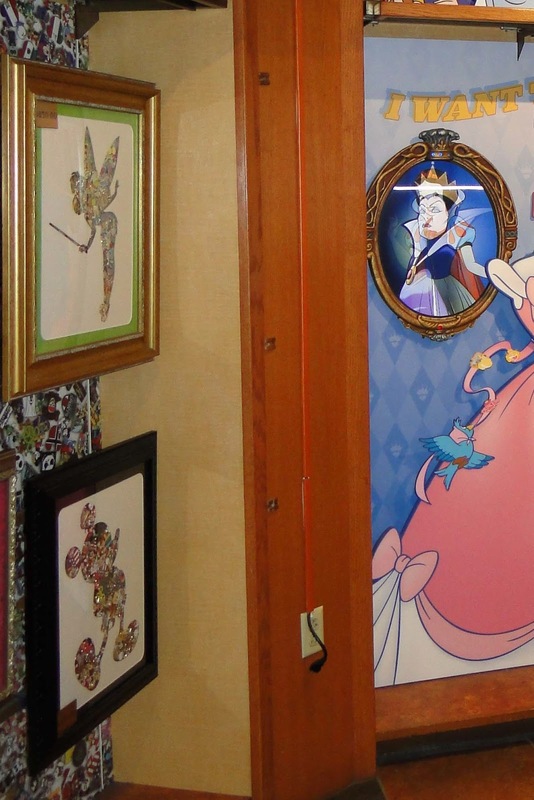 They had cut out silhouettes of Mickey Mouse and Tinker Bell, which were framed. 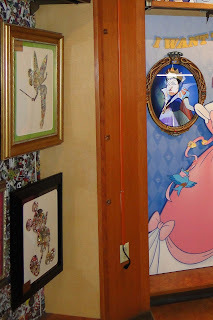 Inside the silhouettes were “colored in” with all different kinds of official Disney pins. My ultimate souvenir would be each and every trip to get a pin collage. The silhouette would be of the year of our trip. Then, each number of the year filled in with the pins from every attraction we experienced, show we watched, resort we visited, character we met and so on so that we had a pin for every single thing we experienced. I would hang them up our staircase and have one for every Disney trip. It would make for a great way to preserve our Disney memories year after year! Product images in this post are from DisneyStore.com or Danielle's living room or Beth's imagination. We don't get anything for this other than the fun of a little dreaming. Many thanks to Natalie from Meet the Magic, Janine from Growing Up Disney & Meet the Magic, Danielle from Life as a Disney Mommy, Corby from Travel with the Magic and Beth from Pursuing the Magic for window shopping along with me today. Please visit our Minnie Moms page to learn more about our Disney-loving moms and read our past articles. The same things I already purchase...Art, lots of art. The Art of Disney would know me very well. Now I miss the Premium AP discount. I would totally get a Disney Dooney! 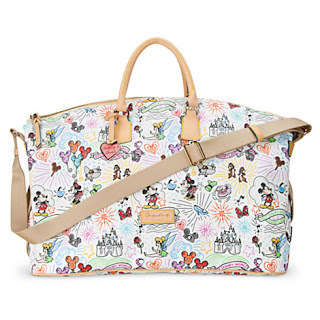 Some Disney luggage for sure! !